The yellow vest movement – so called as the protestors could be easily identified by their luminescent yellow jackets – brought people from all walks of life into the street and uniting people from all parts of the political spectrum, from left-wing anarchists to doctors. Some are comparing the violence to the civil unrest of 1968, which at the time eventually brought the country’s economy to a halt. 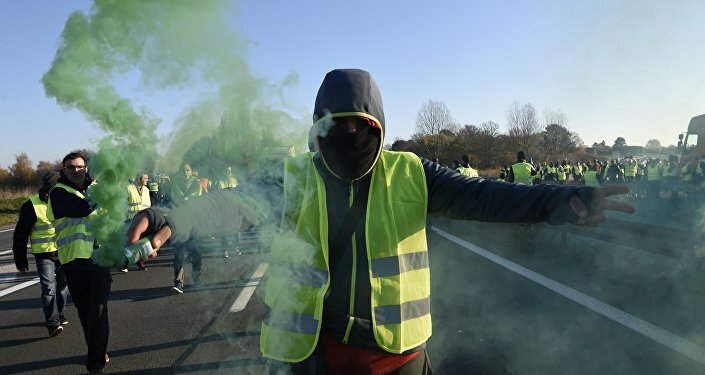 The protests were initially sparked by a rise in tax on diesel, and follow on from previous protests against Macron’s Labour reforms. The President insists the reforms are needed to ensure the country's transition to a low-emission economy, although many people see this as yet another slap in the face for French workers trying to make ends meet. They argue that Macron is a rich man’s president, delivering tax breaks to the wealthy and the business world, while reducing workers’ rights. Sputnik spoke to Gino Raymond, Professor of Modern French Studies at the University of Bristol for more insight on the issue. Sputnik: Do you think we will see a state of emergency declared? Gino Raymond: I don't think so. I think the government is very keen to avoid that for obvious reasons as a state of emergency suggests you can't control a situation. Now Emmanuel Macron has come back from Argentina from the G20 summit and he's clearly staked his territory out. He wants to see order restored; he's given clear instructions to his Minister of the Interior, Christophe Castaner as to what he wants him to do and he's given clear instructions to his Prime Minister that he wants to see dialogue inaugurated so that there can be a negotiated agreement to those grievances. And I think going to a state of emergency — although this is what the police have asked for — and although Castaner seemed to be accommodating that point of view I think in terms of political image and political credibility that's not what the government wants and that's not what the President wants. Sputnik: We've seen a gradual decline in Macron's popularity since his election and an increase in protests with this weekend's protests being the worst in a decade, some have suggested since 1968. Do you think Macron will react to this in terms of looking at his reforms again or will he stick by his mantra that protests are not a show-stopper as he once put it? Gino Raymond: There is a long history in France of Presidents and governments backing down when they are faced with a wave of public protest that threatens public order in a major way. Even Charles de Gaulle in 1963 when he was faced with a miners' strike originally talked tough and then eventually conceded an 11% pay rise, so there is a very long history of that. The difficulty for Macron is that he came in after a Presidency of Francois Hollande which was seen as weak. Some of your listeners may remember his nickname President 'flambee' after a very flabby, jelly-like dessert and Macron came in as the decisive, young President who was going to get France back on its feet. So I think it's going to be difficult for him to concede too much. There are areas where the government can compromise with regard to attenuating the effect of these rises on the fuel tax but I think Macron will try to find a language, a mode of negotiation and will task his Prime Minister, Eduoard Phillipe, to do that. Sputnik: These protests are different this time in that they brought together the left and the right and people from all walks of life, from doctors to artists. 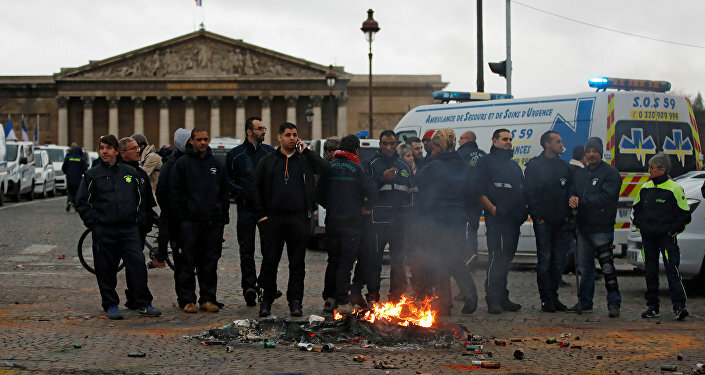 A recent survey before the protests took place showed that 84 percent of French people supported the anti-fuel tax protests. Do you think we are likely to see more such protests in future if Macron doesn't address people's concerns? Gino Raymond: Well I think we're in a new political age; the old parties and old political structures are in decline everywhere. And we're in the age of social media where you can organize things very quickly and people can express their discontent very quickly. But also there are certain strands, or aspects of French society which don't change and it's very interesting the expressions of concern being shown by French people who are sympathetic to the causes of the Gilets Jaunes but they don't like to see all these people stealing from shops and attacking restaurants. France is in the provinces a conservative country so it will be very interesting to see what the opinion polls start to say over the coming weeks. Views and opinions expressed in this article are those of Gino Raymond and do not necessarily reflect those of Sputnik.